Are your social media channels up to scratch? This Excel spreadsheet is a simple download which guides you through auditing your own social media channels. Find out where you can improve your social media channel management and what you’re already doing really well. 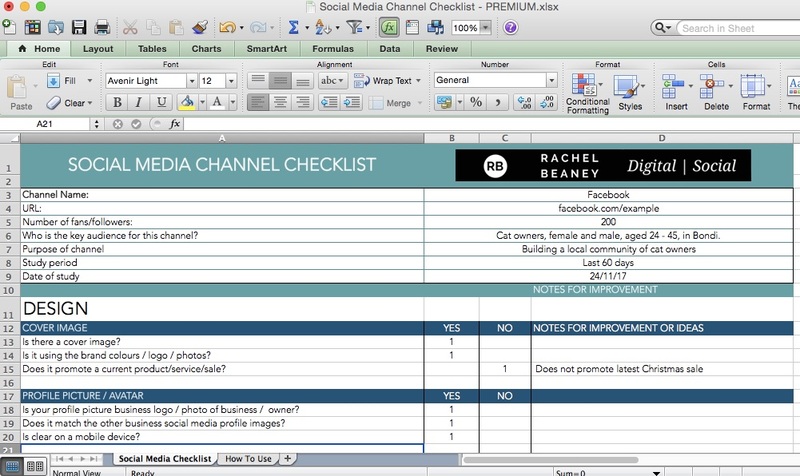 This Excel spreadsheet is an interactive tool which guides you through the key elements of social media best-practice, looking at content, community and design. Is your profile picture easy to see on mobile devices? Have you responded to reviews? Can people find your Facebook Page from your website? Use this tool to find out where you can improve your social media activities, and what you’re already doing really well. While designed for auditing Facebook Pages, this spreadsheet can be adapted to be used across most social media platforms. At the end of the checklist, you will receive a social media channel score out of 100%, so you can see what you’re doing well, and where there is room to grow. Download this baby once, but this tool is useful to review your social media channels annually to ensure you’re on track.